Quote: "A boat in fire had firefighters battling large flames in Gulf Shores. This video was posted on the Gulf Shores Fire Rescue Facebook page Saturday night. The fire was on the water near West Canal Street." Quote: "The blaze gutted the shop building and destroyed a Ford Bronco and a boat that were stored inside. Two pickup trucks were parked outside the structure, and the fire scorched the cargo bay of a GMC pickup. Half of a fifth-wheel travel trailer parked beside the trucks also was charred and partly melted." 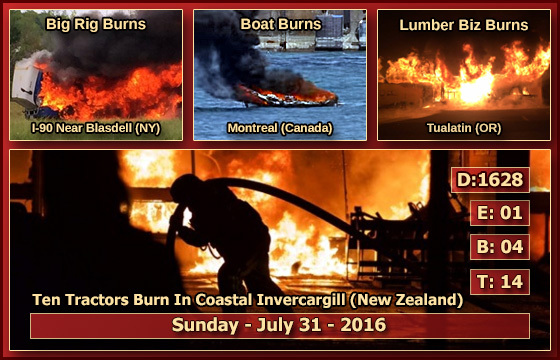 Quote: "Today at noon a rare fire on a boat broke out while three occupants were on board on the St-Lawrence River in Montreal, Quebec. The occupants were helped by other nearby boaters and one of them suffered burns to the foot during the fiery incident." Quote: "Inside the building were four brand new tractors, 14 lawn mowers and about six tractors belonging to customers which were caught in the fire, Wilson said. They also lost one service truck to the blaze along with tools and equipment, he said." Quote: "A Springville Police Officer is in the hospital after a five vehicle crash on Interstate 59 near Springville. Alabama State Troopers confirm the injured officer was assisting the Springville Fire Department with a car fire." Quote: "'We were down by the river and a couple of guys in a boat said, "Do you know that house is on fire,"' Shirley Lowery of Dedham said of the fire." Quote: "A motorcycle in the garage is believed to have started the blaze." Quote: "In response to this fire, 600 people from the Sutcliffe area and 200 people from various at beaches at Pyramid Lake have been evacuated. The gym in Nixon remains open to evacuees. At this time, the Tribe can confirm the following damage in the Sutcliffe area; 1 home, 3 mobile homes, 2 vehicles and 6 structures at the unoccupied Hardscrabble Ranch have all have been destroyed by this wildfire." Quote: "The blaze, which officials are calling the Rail Fire, is in the South Fork Burnt River territory." Quote: "Workers across the street at Hyvee heard an explosion and saw the fire and called 911." Quote: "A Pittsburgh public safety spokeswoman said the blaze Saturday afternoon started in a basement electrical vault and spread through an elevator shaft..."
Quote: "Un Chakrey, an official at WWF, said the mother dolphin and its baby were found side by side in the river near the district’s Bos Leav commune." Quote: "Police received a call Saturday at 7:59 PM about an unoccupied boat circling on the Great Sacandaga Lake about 50 feet from the dock." Quote: "The body was found within 1/2 mile from where a man was found dead last week near a boat ramp." Quote: "A man died while driving down a residential area in central Austin, veering off the road and causing minor damage." Quote: "The Redstone Arsenal resident who was found dead Sunday on the installation has been identified as a two-star general who just moved to Huntsville to take the reins of the U.S. Army Space and Missile Defense Command/Army Forces Strategic Command." Quote: "Maj. Gen. John Rossi, 55, was found dead Sunday at his new home on the arsenal. He was scheduled to take his new command on Tuesday..."
Quote: "Police said there were 'no suspicious circumstances' after Andrew's sudden death." Quote: "Eight people were killed when an executive jet crashed into an industrial warehouse in southern Brazil, barely missing a nearby church holding service, official sources said yesterday. The twin-engine Piper Navajo jet crashed onto the facility belonging to the Excellence transportation company on Sunday night in Cambe, Parana state, hitting a bus and exploding on impact." Quote: "Three buses crashed in the northbound lanes of I-196 near the Kalamazoo River -- the 9th accident in that area in recent weeks, a fire chief said." Quote: "Officer Beckwith pointed his Taser at the suspect but he continued to advance on Beckwith. That's when he discharged his Taser but it didn't have any effect on Barnes, according to police. Barnes then allegedly assaulted Officer Beckwith and they fell to the ground and rolled down a hill over rocks and dirt." Quote: "Heavy rains in Fort McMurray, Alta., have caused flooded streets and knocked out traffic lights, forcing the Regional Municipality of Wood Buffalo to activate its emergency operations centre for the first time since parts of the city were devastated by a wildfire in May."